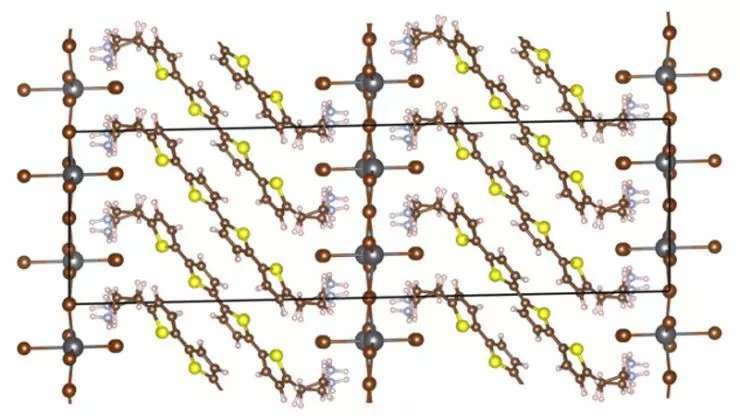 These types of so-called layered "hybrid organic-inorganic perovskites"—or HOIPs—are popular targets for light-based devices such as solar cells and light-emitting diodes (LEDs). The ability to build accurate models of these materials atom-by-atom will allow researchers to explore new material designs for next-generation devices. In the new study, Chi Liu, a graduate student in Blum's laboratory; Yosuke Kanai, a fellow theorist at the University of North Carolina – Chapel Hill; and Alvaro Vazquez-Mayagoitia, a scientist at Argonne National Laboratory, used Theta's computational power to model the electronic states within a layered HOIP first synthesized by Mitzi more than a decade ago. While the electrical and optical properties of the material are well-known, the physics behind how they emerge have been much debated.